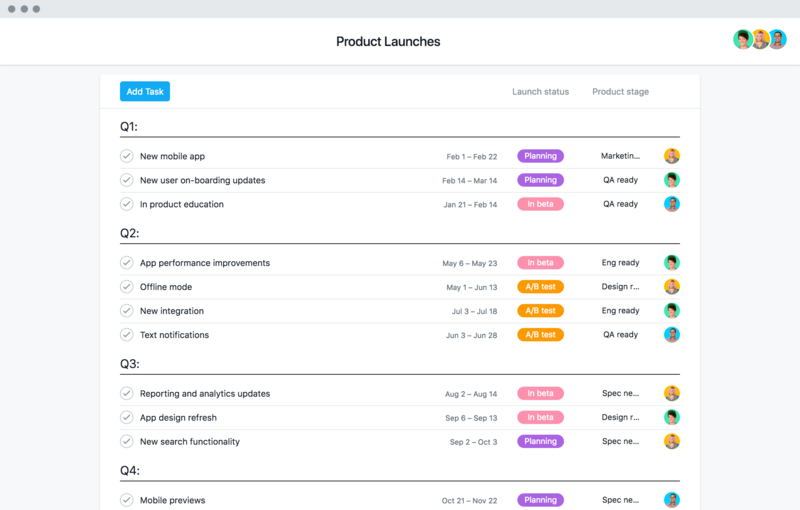 How can you hit product launch deadlines, connect cross-functional teams, and see launch updates all in one place? With a product launch template. Include the essential details and teammates. Once you’ve got the launch spec, share your product launch plan with all stakeholders to create a plan everyone’s bought into. Make steps and deadlines clear. Use the template to get started quickly, and add key information and deadlines to the tasks. Use a project Timeline (or any Gantt-style view) to spot timing conflicts before they happen. Keep key launch assets accessible. Every launch comes chock full of assets like specs, messaging, and product designs that can get lost in the mix. Instead of working off old docs or pinging teammates for the file, keep your assets in the same tool you use to manage projects. Provide regular updates. Instead of responding to ad-hoc questions or wasting time in meetings, share regular project status reports for everyone to see how your launch is progressing. What if the secret to your best launch yet wasn’t about the idea behind it, but the process to take it to market? Project plans don’t always go according to, well, plan. Here’s how to adapt to changes.